I had to visit Edmonton for the last couple days. While I was getting ready to return, I noticed and picked up one of the local free newspapers – the Edmonton Metro. The story on the front cover looked interesting and I wanted to read what it was all about. Sure enough it was interesting. It was interesting enough that the Edmonton Journal also picked up the story and ran it in the front section, if I recall correctly (although not on the front page). Briefly, the Edmonton news relates to a billion-dollar project called The Galleria (not to be confused with the gift shop and gallery of sorts that shares the same name in Calgary). The Edmonton project yesterday received a city council investment of $7.5 million, not to mention another $50-million that was already raised privately prior to going to City Council. This new project will incorporate a new home for the University of Alberta Art and Design faculty, four new theatres and some mixed use development. 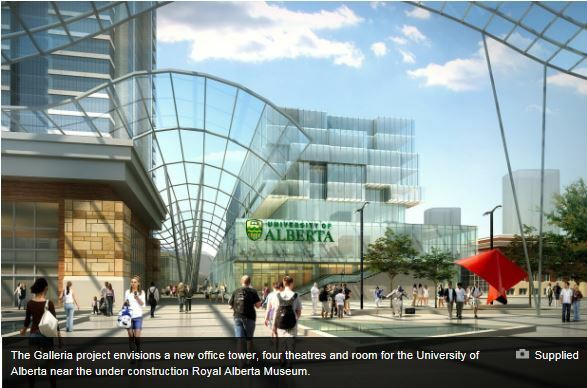 It will be located adjoining the new Royal Alberta Museum that is currently under construction. You can read about it here. Of course when I got back into Calgary, I got onto my computer to see what was going on in Calgary as well. Imagine my surprise upon my return, to read a number of things going on at the Alberta College of Art and Design both yesterday and today as well. Of course, a certain amount of activity at educational institutions is to be expected as the school year has wound down and administration can focus on infrastructure projects, planning, etc. over the summer. What is happening at the Alberta College of Art and Design that might relate to the project at the University of Alberta? After my preamble, I will now turn over the significant majority of the remainder of this posting to two people. I do this because I was not privy to the discussions around this decision or the email that was sent out. . . and there is always more than one side to a story. Often reality is somewhere in the middle. The first person that I want to turn the mike over to is a person by the name of Shauna Thompson. The name is familiar, but I don’t know her personally (or at least I don’t believe so). She posted something to the Alberta College of Art and Design facebook page yesterday and suggested that it could be broadcast widely. Her comments relate to an internal email that was circulated by ACAD to the ACAD community. I must assume that it was sent out yesterday. I can only rely upon the comments of someone else who received it however it came about whether it was direct or not. I understand there is some risk in this, because it may not be factually correct, however I will assume that she has some knowledge of what was included. In an email sent to staff and students about “key” budget cuts and restructuring, ACAD administration revealed in a bullet point that IKG Director/Curator Wayne Baerwaldt will be “retiring” at the end of June and they have chosen NOT to fill this position. ACAD claims that the gallery will not close, but instead “[o]ver the next few months we will work with internal groups on a new management model and plan of action aligned to serve the educational goals of students and faculty of the College within our new fiscal reality.” There has been no official press release that I know of; only this surreptitious, post-semester email. The idea that a contemporary art gallery embedded within an art school should be required to prove why their existence is important is ludicrously out of touch. It’s telling that ACAD has effectively reduced Wayne, the IKG, and everything their presence has brought to the school — AND TO CALGARY — to a bullet point in a memo. These are things that we, as a community (and I mean within Calgary and beyond it), need to fight for. There are a lot of questions that remain about the administration’s ultimate intent, but this is the kind of terrain we shouldn’t give up to disingenuous announcements about “new fiscal realties” (sic). There has been a lot of talk recently about the relevance of post-secondary arts institutions. What does it mean to the students and to the ecology of an art school to operate without a professional contemporary art gallery? What does it mean for an historically culturally isolated city like Calgary to have even less exposure to international contemporary art, artists, and ideas? What does it mean for all of us when a space for research, support, and presentation of visual art is carved up by administrators with barely a whimper? This isn’t the kind of thing we should let slide. I will be the first to admit that I am certainly not in the loop about what is happening at ACAD and at the IKG. But I am definitely interested in what is going on there. Be that as it may, Thompson’s questions do have some validity as it relates to a public gallery that is embedded in any educational institution of merit. Students need to be given access to original work as part of their program of study. How they do that, is something that I will not address, nor should I. Art cannot be learned in isolation, regardless of the fact that most art that is made is a product of predominantly solitary studio-based practice by the artist. If the instruction is focused on predominately contemporary practice, the gallery attached to the institution should also focus on contemporary practice and/or work that will inform contemporary art practice to encourage student growth. Galleries in an educational facility serve an important role that cannot be overemphasised. Wayne Baerwaldt, The Director of the Illingworth Kerr Gallery (IKG), is retiring at the end of June. We are very grateful to Wayne for his close to a decade of service at ACAD, not just at the gallery, but also in his role as VP Research and Academic Affairs. He brought a discourse and variety to the College with gallery exhibitions that made an impact on the entire artistic community. His support and passion for students and education was certainly evident. The IKG is not closing. We are fortunate to have such a space within our walls. It remains an important part of the student experience at the college and we are taking this opportunity to review the role it plays in our institution and how it can better serve our community without filling the director’s position. World-class exhibits will continue to be curated. We have a very robust visiting artist program at the college and the gallery is steadily becoming a destination for incredible art in Calgary. To that end, an internal committee formed (including faculty, staff, students and alumni) and we will create a new operating plan in the next few months. The quality of the programming will be unaffected. ACAD’s goal is to make it even more inclusive and representative of the variety of programs at the college to help us thrive and support future academic growth. 1. 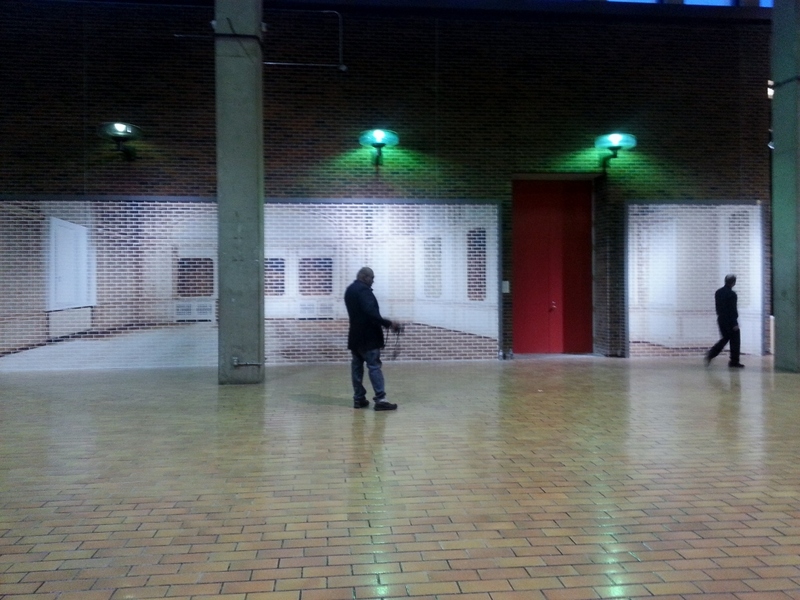 A Curatorial structure overseen by a faculty member appointment assisted by an internal exhibit committee. 2. We will fill a current administrative vacancy to support gallery operations and coordinate visiting artists, scholars and speakers. 3. The Gallery Technician will remain an integral part of the gallery. Creativity matters now more than ever. We are embarking on a sustainability process to generate ideas and solutions that supports our school, our community and our world. Like most post-secondary institutions, especially those with less than 4,000 students, ensuring the longevity of the college is our top priority. It is an exciting time at ACAD right now as we are embarking on a visioning process that collectively students, faculty and staff can reimagine… rethink…and redesign how ACAD will look for the next 90 years and beyond. From the opening part of the press release, it would appear as if the future plans for the gallery are already in place. This makes the final two paragraphs somewhat intriguing, especially given the use of the root word “embark” or as used in both paragraphs, “embarking”. If I understand the term correctly it means something to the effect of – to board something (especially as it relates to a plane or boat); to begin, or; to start a new course. I am going to make an assumption that in this case, the third meaning is the intent as used. I can’t argue with the sentiment of the first paragraph with the highlighted talking point beginning with “creativity matters now more than ever.” In this section it talks about sustainability. Financial stability is necessary for any institution, business or person if they want to survive, no matter how large or small their financial resources are. However, I do find it surprising that a small part of the budget, (the Illingworth Kerr Gallery) as presented here, it would appear to be a mainsail, or at the minimum a jib, of the boat (ACAD) that is being embarked. From what little I know about budgets, it would be a fair assumption to assume that teaching staffing for a degree-granting institution as a whole, should be substantially higher than operations of a small gallery with a staff of less than five (I am assuming), even if staffing is included as a direct cost of its operations. Of course, I don’t know what was all included in the first email that prompted Thompson’s comments. However being aware of corporate speak, it would seem fair that that there is significantly more financial austerity planned from ACAD, given that she mentioned the Illingworth Kerr Gallery/Wayne Baerwaldt situation as a bullet point amongst other “new fiscal realities.” If so, then the final paragraph may make more sense and it makes me wonder why there was not another press release issued to talk about those items as well. To my mind, based on the comments made at the beginning of the press release and the course of action suggested in the remainder of the press release, it would be a logical progression that the decision has already been made. It would also seem like another logical conclusion that there is no “embarking” that needs to take place. If this assumption is true, it then makes me curious about the remainder of the last paragraph and prompts me to ask the question – how involved in the visioning process were the students, faculty and/or staff in this decision? It is something that I have no answer to. Maybe it was done, maybe it was not. I also have one concern about the future stated plans of IKG as outlined in the press release. It is based strictly on my own observations and experiences, and this could be an exception (there always is one). My concern is that artistic direction by committee typically is much more challenging and problematic than not. As a general rule, it makes programming much more unfocused, inconsistent and uneven as a result. Some would even suggest the result often is mediocrity. This prompts another curiosity of mine relating to the paragraph with the talking point “The quality of the programming will be unaffected”. It is a question about what was meant by the use of the word “inclusive”. At an educational institution of higher learning in the visual arts, is “inclusive” programming (however that is defined) something that should be aspired to? Or should programming be made so that students can see current work by artists producing at the top of their game; work that may be controversial with the intent of stirring creative juices amongst student (an example would be a work by Chris Burden that was made at ACAD in the 1970s that resulted in bringing out the fire department and made the local news); and/or works from the collection that show significant works that show how we got to where we are now? Regardless, I can foresee that there is a high likelihood that the issue of artistic programming by committee will need to be addressed at some point, whether during the time of this administration, or next. No doubt this is a complicated matter, with few simplistic answers. This brings me full circle, back to the Galleria in Edmonton. The two cities are approximately 300 km from each other, both within the same provincial jurisdiction. However, the focus between the two projects spearheaded by academic institutions (presumably both facing similar fiscal realities) couldn’t be more different. We see one project has a focus on expansion of a visual arts program with a substantial buy-in from the community at large; whereas the other project seemingly has a contraction of a visual arts program with an unknown quantity of buy-in from the community. My question is, why the disconnect between the two? It will be interesting to see where these two projects end up. I will definitely be watching both projects with interest. This entry was posted in Alberta College of Art and Design, Commercial Galleries, cSPACE, Illingworth Kerr Gallery, Progress. Thanks for telling me about this – quite a good read. I had no idea that the arts program was expanding in Edmonton at all. I have followed the going on in Edmonton for quite some time. In many ways it is almost as if Edmonton is located on a different planet from Calgary. There is a quiet support there from the community at large and the broader arts community that is not evident in Calgary as a general rule. I don’t know why it is.